The Milliard 6-Inch Memory Foam Tri-fold Mattress is one of the best folding mattresses available. This folding mattress is extremely convenient. Fold it up and take it wherever you go, then simply unfold it and you have a comfortable memory foam bed. This is the perfect guest bed. It’s comfortable enough for any adult to sleep on with no complaints, and it can easily be folded up and stored away when not in use. The Milliard 6-Inch Memory Foam Tri-fold Mattress is made of a 4.5 inch supportive foam base plus 1.5 inches of memory foam. This makes a total of 6 inches, which is fairly high for a folding mattress. The addition of memory foam takes this mattress to the next level. Memory foam is a special type of foam that cushions the body, providing superior comfort and support during sleep. The memory foam in the Milliard 6-Inch Memory Foam Tri-fold Mattress is ventilated to ensure adequate airflow. This means that, unlike other memory foam mattresses, the Milliard 6-Inch Memory Foam Tri-Fold Mattress won’t get too warm at night. You’ll maintain a comfortable sleeping temperature while enjoying the luxurious comfort of real memory foam. The memory foam in this mattress is the highest quality, too. The Milliard 6-Inch Memory Foam Tri-fold Mattress contains premium memory foam with a high-density construction. This means the memory foam in this mattress will last longer than many other memory foam mattresses. The Milliard 6-Inch Tri-Fold will provide many peaceful nights of sleep for both you and your guests. The mattress comes with a removable cover. This is especially convenient, because you can take the cover off and throw it in the washing machine. The cover is made of bamboo, which is one of the softest bedding materials available. In addition, the cover has a non-slip bottom. You can unfold this mattress onto hardwood floors and sleep through the night without the mattress sliding around under you, thanks to the non-slip cover. 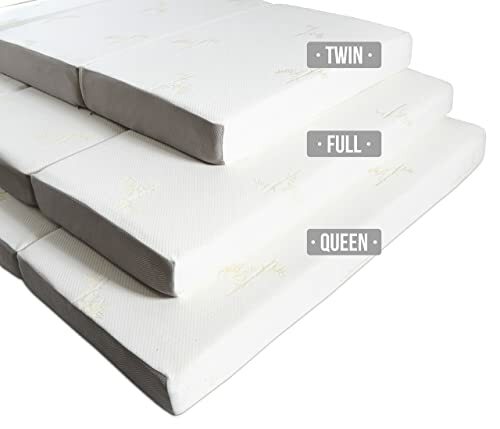 This mattress comes in three different sizes: twin, full, and queen. This wide selection is great if you’re thinking of using the Milliard 6-Inch Memory Foam Tri-fold Mattress as a guest bed. You will be able to accommodate larger adults as well as couples with a queen size mattress. However, the Milliard 6-Inch Mattress might not be ideal if you’re looking for a folding mattress you can take on the road with you. Even the smallest size, the twin size, is fairly large when folded up, measuring 38 in. x 26 in. x 18 in. The mattress does not come with any sort of carrying case or bag, and there are no handles on the mattress, either. This means you’ll have to figure out how to transport it yourself, which can be difficult given its size. The twin size Milliard 6-Inch Memory Foam Tri-fold Mattress weighs just under 30 pounds, so it’s not too hard to lift, but you certainly don’t want to be carrying this around for a long time. The size of this mattress also means it can be a bit of a challenge to store, especially if you’re planning on ordering the full or queen size. Check your closet or storage space and measure carefully to be sure the mattress will fit. If you order the Milliard 6-Inch Memory Foam Tri-Fold Mattress online, it will ship to you in a vacuum-sealed bag. 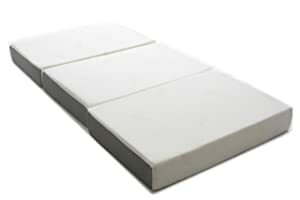 This allows the manufacturer or shipper to condense the mattress down to a smaller size for transport. Keep in mind when your mattress arrives that it will need time to expand to its full size, and be sure you can find storage space for it once it’s expanded. Another common complaint with the Milliard 6-Inch Memory Foam Tri-Fold Mattress is the smell. When you first open the mattress and let it expand, it may need to air out a bit. Memory foam often has an unusual chemical smell when it’s new. Depending on where you store your mattress and the climate you live in, it may take a few weeks for the smell to completely disappear. Rest assured that the smell will eventually go away with time. Overall, the Milliard 6-Inch Memory Foam Tri-Fold Mattress is an excellent option if you’re considering a folding mattress as a guest bed. The luxurious memory foam makes as comfortable as any regular mattress, and it certainly provides greater comfort and support than most other folding mattresses. The removable bamboo cover is extremely soft, and it’s easy to wash and put back on. 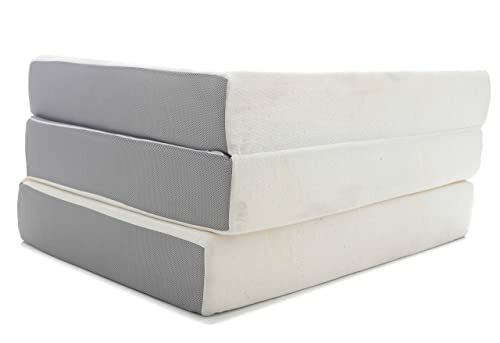 If you’re looking for a smaller folding mattress to take on sleepovers and camping trips, the Milliard 6-Inch Memory Foam Tri-Fold Mattress might not be your best option, due to its thickness and difficulty to transport.